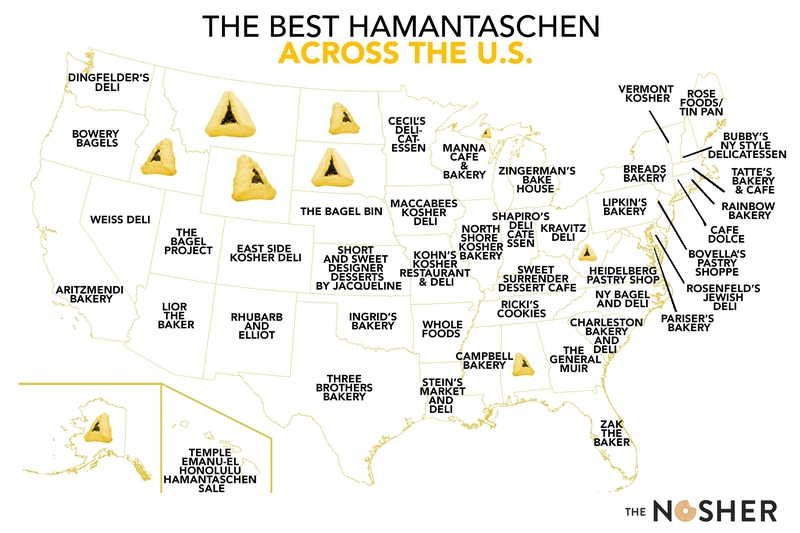 This Map Shows Where to Get the Best Hamantaschen Across the U.S.
Don't feel like baking? 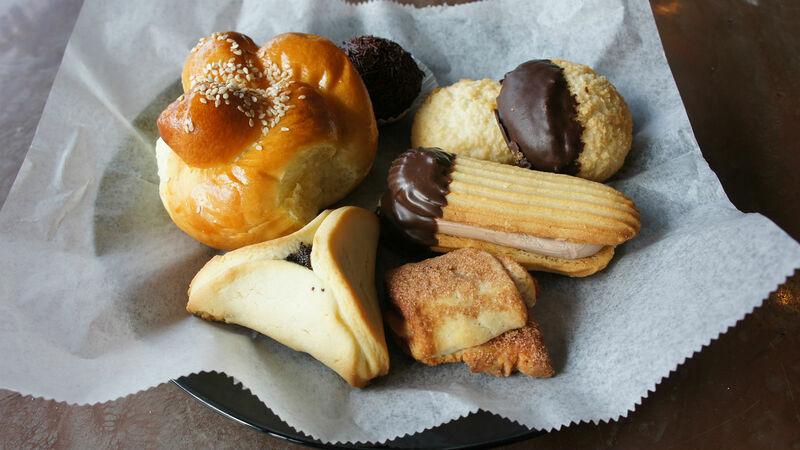 Check out the best places to buy your Purim treats. In celebration of our favorite three-cornered treats, we searched near and far for the best hamantaschen in every state. Extreme amounts of Facebook and Instagram stalking, email inquiries, personal taste-testing, and phone calls (yes, sometimes I still use a phone) resulted in this epic list. Enthusiasm greeted me in the most unlikely places—the German bakery in Oklahoma, for one. And in the southern and midwestern states, I was often met with “haman-what?” It was a learning opportunity for us all. As you might predict, the availability of hamantaschen follows the diaspora of Jewish Americans, and in many cases, the curiosity of Jewish and non-Jewish bakers alike. In places with few or no bakery options, hamantaschen bake nights are a highlight of the season at synagogues and community centers. Of course, we couldn’t cross every state off quite yet and NEED YOUR HELP! We’re looking at you, Dakotas. Gotta favorite bakery in one of the missing states? Let us know your favorites in the comments. No bakery near you? These bakeries all ship hamantaschen nationwide! This is the go-to spot in Scottsdale for beautiful, Israeli-inspired based goods. For Purim, Lior bakes classic hamantaschen with prune, walnuts, or poppy seeds. 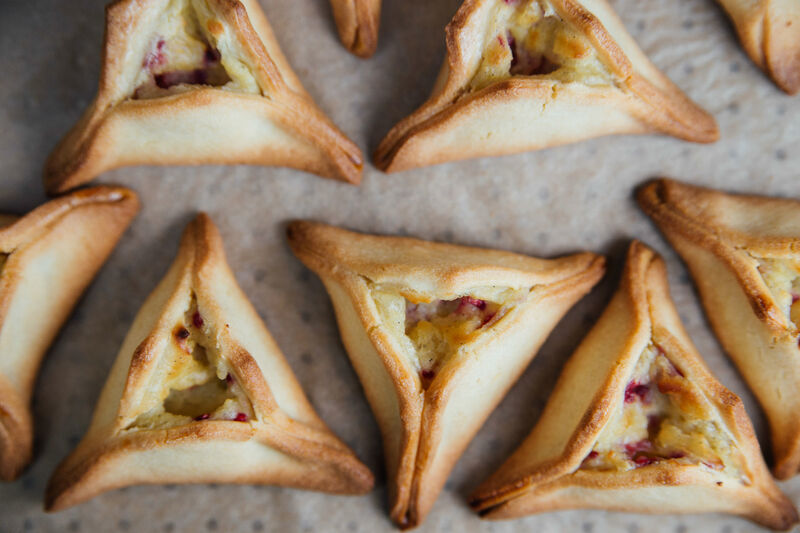 Everything they bake looks flawless—including their hamantaschen, which are pinched perfectly. When all else fails, try Whole Foods! In Fayetteville, while they don’t regularly carry hamantaschen, they are happy to make them special order if you call. Every Purim, Arizmendi Bakery makes chocolate ganache and poppy walnut hamantaschen, which are so good that you might miss them. Begun by the famous Cheeseboard cooperative, Arizmendi Bakery is named after the Basque labor organizer—what’s more San Fransisco (or Jewish) than that? This charming cafe bakes everything from scratch, and they seem to be the only ones not shipping them in from nearby New York. They’re so good that you might not want to make your own this year. If you’re in the market for gluten-free hamantaschen, try Izzy B’s Allergen-Free, which come in chocolate, plum, and raspberry. Denver’s classic Jewish deli is kosher, and prepares their baked goods with lots of passion. This year, they’re baking apricot, prune, raspberry, chocolate, and poppy seed hamantaschen. The bakers get creative, so you might find other flavors when you’re there! Sometimes the best hamantaschen isn’t made in-house, but that doesn’t disqualify it from being the best in the land. Rosenfeld’s Jewish Deli gets them from nearby Liscio’s Bakery in Glassboro, New Jersey. They serve prune, apricot, and raspberry hamantaschen. When it comes to Jewish cuisine and breads, Zak the Baker in Wynwood, Miami is one of the most exciting places to be. Their kosher kitchen sends out colorful plates of cured meats and pickled vegetables, and their bakery makes everything from challah to hamantaschen. This year, for a limited time, they’re making chocolate poppy, guava and cheese, and butter pecan hamantaschen for Purim. This top-notch delicatessen and James Beard Award semifinalist bakes delicious three cornered treats every Purim. Last year, they made fig and poppy, apricot and pistachio, and wine-poached prune hamantaschen. You can pick them up in-store or place an order ahead of time. When I reached out to ask who makes the best hamantaschen in Hawaii, the education and youth director enthusiastically replied, “Me!” She grew up making these cookies and now teaches a group of bakers of all ages how to pinch or fold the corners just right. Proceeds from the sale benefit the Jewish Experience Center. You can order chocolate, apricot, strawberry, or poppy seed. Chicago has plenty of Jewish bakeries to choose from, but what sets this kosher bakery apart is that they make a yeast hamantaschen, which is how they used to be made. Instead of sugar, they use honey, which owner Ayellet Benezra told the Chicago Tribune, “gives the cookies a heavier, more cake-like consistency.” These hamantaschen are filled with raspberry, chocolate, lemon, apricot, poppy seed, and prune. Since 1905, Shapiro’s Delicatessen has played a delicious role in the culinary landscape of Indianapolis. They bake hamantaschen every Purim, filled with vanilla bean cream cheese, lemon poppy seed, apricot, and prune, and dusted with powdered sugar. Iowa’s only all-kosher grocery and deli is also home to the best hamantaschen in the state. They have prune, poppy seed, apricot, mango, raspberry-pomegranate, and chocolate. In a state with few kosher options, Jacqueline delivers, and goes above and beyond to craft gorgeous, home-made hamantaschen for any dietary need. When the Jewish baker of this Kentucky cafe got more and more requests for hamantaschen every Purim, she became the first bakery in the Louisville area to bake them. This year, she’ll make strawberry, raspberry, and apricot hamantaschen. Everything in their bakery is dairy kosher and made from scratch. The best hamantaschen in Louisiana are found at New Orlean’s best Jewish delis. Kosher Cajun NY Deli & Grocery gets a festive array of hamantaschen from Green’s Bakery in New York (apricot, raspberry, prune, poppy, chocolate, chocolate-dipped with sprinkles, sugar-free, and gluten-free) and delivers some to Stein’s Market & Deli, which sells them to their Garden District crowd. There is a Jewish food renaissance happening in Portland, Maine, right now and Rose Foods, the city’s bagel and smoked fish destination, and Tin Pan Bakery, the local bake shop, are two key players that deserve equal attention for their hamantaschen. This year, Tin Pan Bakery is making poppy seed, apricot, cherry, and chocolate hamantaschen. Pariser’s has been in the kosher baking business since 1899, so they know that one size doesn’t fit all—that’s why they make at least 10 varieties of hamantaschen, which come in small, medium, and large. Their dough is inspired by the yeast hamantaschen of the past, which makes their cookies somewhat softer than their hard-crusted sugar cookie cousins. Choose from chocolate, poppyseed, prune, apple, lemon, cherry, strawberry, raspberry, blueberry, or apricot hamantaschen. Founded by a self-trained pastry chef from Tel Aviv, Tatte’s, which has 11 different locations in the Boston area, is famous for their seasonal and Israeli-inspired croissants and pastries. But hamantaschen are founder Tzurit Or’s very favorite. Every year, her mother ships her 50 pounds of poppy seeds from Israel, which Or simmers into a delicious filling for hamantaschen. They also make strawberry jam and chocolate-filled hamantaschen, which they began selling on March 6th. With rugelach, babka, and Mandelbrot on the menu, Zingerman’s Bakehouse might be the Midwestern capital of Jewish baked goods. Come Purim, you can savor their apricot, sweet cheese, poppy, and prune hamantaschen. At Cecil’s, hamantaschen are for year-round noshing. You can find apricot, cherry, raspberry, chocolate, and poppy seed at their classic Jewish deli. This deli, open since 1949, is the last remaining establishment of it’s kind in Minneapolis. Finding hamantaschen in the Deep South is like finding a needle in a haystack. At Beth Israel Congregation in Jackson, you can order hamantaschen for a fundraiser that benefits their religious school. They’re baked by Campbell’s Bakery in Jackson, and you can order from the following menu of flavors: apricot, strawberry, chocolate, raspberry, and poppy seed. For over 50 years, this immigrant-founded kosher deli has been churning out knishes, strudel, Krishna, and of course, hamantaschen. They make apple, apricot, cherry, prune, and poppy hamantaschen year-round, and for Purim, they make a yeast hamantaschen, which is how they were traditionally made in Germany and Eastern Europe. The family behind The Bagel Bin has been baking kosher bagels and Jewish pastries for the past 40 years, and their hamantaschen at this time of year are freshly baked and picture-perfect. The only kosher bakery in town, they take pride in their bagels and baked goods, many of which are family recipes from Poland. Taste the rainbow by trying their different hamantaschen—there’s cherry, strawberry, raspberry, apricot, lemon, prune, and poppy seed. Hamantaschen aren’t just for Purim at this old-school Jewish deli— they make raspberry, cherry, apricot, prune, and poppyseed hamantaschen year-round. Be sure to come here with an empty belly so you can also try their sweet and sour cabbage and matzah ball soup. At Bubby’s you can order your hamantaschen with a side of Bubby’s “Jewish guacamole” (chopped liver spread with bagel chips) or one of their many indulgent deli sandwiches. This Purim, they’re baking apricot, poppy, and raspberry hamantaschen. Known for their variety of classic Italian and Jewish cookies, it’s hard to decide what kind of hamantaschen to get at Bovella’s. In addition to the classic apricot, prune, and poppy flavors, they make Oreo, red velvet cheesecake, chocolate chip, and chocolate chocolate hamantaschen. At the JCC in Albuquerque there’s a cozy cafe where they make hamantaschen for Purim. This year they’ll have delicious apricot hamantaschen featuring locally made jam, poppy seed, chocolate, and raspberry. Bread’s babka may have put them on the map, but their savory hamantaschen, which they began making in 2017, have altered the landscape of hamantaschen possibilities. This year, their pizza hamantaschen and pistachio cherry hamantaschen are new to the menu. They also have poppy seed, apricot, and chocolate hamantaschen if you crave the classics. With a kitchen full of Ashkenazi comfort foods and a counter of freshly baked macaroons and innovative, seasonally-inspired sweets, Peck’s is a place that blends Lower East Side deli tradition (the owner’s grandfather owned Ratner’s, after all) with Brooklyn’s vibrant food scene. You can make an order for their popular hamantaschen if you act fast—this year, they’re making apricot, sour cherry, and poppy seed. This bagel and challah destination is well-known for bringing a taste of New York to North Carolina. 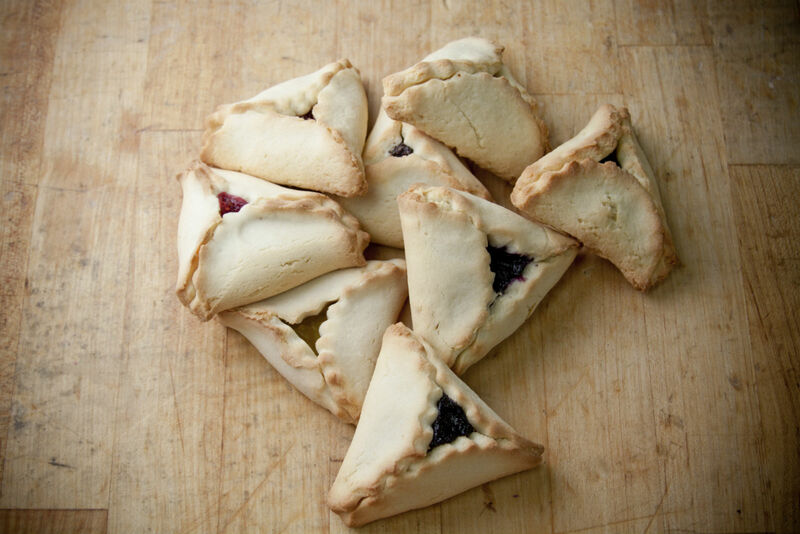 During Purim, they bake poppy, prune, raspberry, blueberry, chocolate, lemon, apricot, and cherry hamantaschen. This classic Ohio deli makes 10 different varieties of hamantaschen every Purim. Choose from cheese, apricot, poppy, cherry, banana cream, raspberry, blueberry, chocolate, apple, and lekvar, which is prune filling. This family-run deli has been serving Jewish deli favorites and holiday treats since 1939. This German-American bakery makes hamantaschen in small batches, all year round. They typically have 8-10 on hand, so place an order if you need more. They make cream cheese and cherry hamantaschen daily. It’s not easy to find hamantaschen in the Northwest, but when you do, you strike gold. Bowery Bagels makes kosher hamantaschen in three mouthwatering flavors—poppy seed hazelnut, apricot, and prune. For three generations, the family behind Lipkin’s Bakery has been one of Philly’s finest kosher bakeries. Their hamantaschen are sold year-round, and they come in prune, cherry, lemon, apricot, chocolate, and raspberry. What the Providence Journal calls “the last Jewish bakery in Rhode Island” is a treasure, owned by the grandson of the Russian-Jewish baker who opened it 100 years ago. Their hamantaschen are just as famous as their bagels and sissel rye. This deep-south deli prides itself in “preserving the traditions of the Jewish bakery and delicatessen,” with cream cheese and bagels as good as Zabar’s and holiday desserts like hamantaschen. In past years, they’ve made poppy seed, raspberry, and apricot hamantaschen, and this year, you can place a special order. What started in her kitchen in the ’80s as a cookie and challah business has steadily grown into a brick-and-mortar, kosher certified business with a loyal fan base. For Purim, she bakes apricot, strawberry, cherry, chocolate, poppy, and prune hamantaschen. Ricki’s special touch is a sprinkling of cinnamon on top. Three Brothers Bakery, which we’ve covered as one of the best Jewish bakeries in the US, is an award-winning Houston bakery, founded by three brothers who survived concentration camps in Poland. Since then, they’ve created one of the most beloved Jewish bakeries in America. Their hamantaschen have charming zig-zag edges, and they’re filled with prune, cherry, blueberry, lemon, apricot, raspberry, and chocolate. (And our Editor Shannon says they are hands-down the most delicious hamantaschen she’s ever tasted). Home to the best bagels in Utah, The Bagel Project serves old-world bagels, bialys, and appetizing with a local Salt Lake City twist. This winter, their seasonal hamantaschen was all the rage, filled with cranberry lekvar (prune). For Purim, they’ll serve fig, currant, mango and prune and flavored hamantaschen. Certified kosher hamantaschen aren’t easy to find in Burlington, but you can make a special order from Vermont Kosher, which is run by an Israeli-American self-trained chef who has a creative touch and an eye for presentation. At this European-style pastry shop and deli, you can find apricot, hazelnut, poppyseed, prune, and raspberry hamantaschen year-round, but during Purim, they’re adding two special kinds to the menu—apple-cinnamon and chocolate hamantaschen. This family-owned deli has apricot, raspberry, prune, poppy and chocolate sprinkle hamataschne to satisfy all your Purim cravings. And we dare you to resist ordering one of their mouth-watering deli sandwiches while you’re there. James Beard-nominated chef and baker Mark Furstenburg’s hamantaschen are not to miss—they’re filled to the brim with home-made jam and expertly crafted. This year, he’s making prune, poppy, and apricot. With deep roots in Jewish baking (their family ran the beloved Pratzel’s Bakery in St. Louis), this Madison cafe is Wisconsin’s destination for rugelach, bialys, corn tzitzel rye bread, and of course, hamantachen. This year, they’re baking three flavors—poppy, apricot, and orange date.